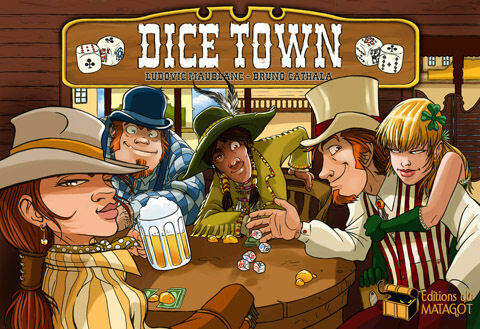 Dice Town is Yahtzee on steroids - It's a dice game, a risk taking and, in a way, a bidding game. Players roll their dice, and with each roll must keep one, rerolling the remaining ones, in a way more similar with Yahtzee than with poker. For one dollar, you can keep or reroll one more die. In the end, the player with the most 9s on his dice get the mine (and the gold), the player with the most 10s robs the bank, the player with the most Jacks controls the drugstore, full of item cards with fun effects, the player with the most Queens, or girls, controls the saloon, the player with the most Kings is sheriff, and receives both a useful gun and a shining star worth some victory points, and lastly the player with best poker hand can claim land plots depending on how many aces he has. Game ends when the gold mine is exhausted, and the players score points for gold, dollars, land, sheriff starsâ€¦. Highest score wins and becomes the first mayor of Dice Town. - Quote from Bruno Faidutti's website. Other products in the "Dice Town" series. Great game. Poker dice meets the old west. Roll the best hand, collect gold, cash, and land and have the most points at the end of the game. Your opponents wont make it so easy though by stealing your land, and your cards. great fun for 2+ players. A fantastic poker-style game with dice. Easy for anyone to pick up quickly, and while there is a lot of luck in the game, there is still a decent amount of strategy for those looking for it. A great, fast game that could work with almost any group of people. Great little dice game, the collecting of the poker hands will elicit cheers or groans depending on how many others are going for the same goals. A riot especially with bribing the sheriff. Great fun has had by all. A fun dice game with nice tension at the reveal of the 'hands' and finding someone else is competing against you to rob the bank or mine the gold mine. The cards are a good addition and add some strategic elements to th game. A very nice filler game. A fun, fast game that the whole family can enjoy. You try to collect poker hands and some rivalry is bound to happen when players go for the same hands. If you roll badly, you can still get good stuff by visiting Doc Badluck. The money in this game is REALLY good quality, not made of paper. I wish all game money were made like this. Who knew poker dice could be so fun? Mix in a western theme add some great components and you have a fantastic game. Don't worry if you have perpetual bad dice luck, you can always visit Doc Badluck at the end of town. Press your luck with a little bit of role-playing. I love the feel of this game! It's light enough to play with pretty much anyone, but has enough strategic decisions to keep me interested. Definitely check it out if you play games with "non-gamers" from time to time. If you are interested in buying this game you need to buy the expansion with it. I had thought about selling Dice Town but then I purchased the expansion. Is it 10 times better? 100 times better? You decide. Regardless, it's no longer for sale. This is a fantastic family game. It allows for great strategy and replayability while still being simple enough for my 8-year-old to enjoy. The components are great, the theme is great, the game is great. Highly recommended.